The comparisons of the Afghan War to Vietnam are pure hyperbole. The list of reasons are numerous but when you compare the total cost in human life lost in both wars there is simply no comparison. I think it’s incredibly disingenuous and disrespectful to compare the two wars considering what a horrible war Vietnam was which is still etched in the memories of millions of Americans. The current Afghan War is not even like the Soviet occupation in that same regard. In fact it is much more correct to compare the Vietnam War with the Soviet occupation of Afghanistan since both wars were two examples of superpowers defeated by two determined foes supported by two superpowers. However there is no superpower supporting the opposite side in Afghanistan this time. Furthermore, the Afghan War is not like the Iraq War either. Iraq had a stable faction in Northern Iraq with the Kurds and the US destabilized the Sunnis and Shiites. However before the Iraq War it was a stable and more progressive society than others in the Mideast. The most destabilizing faction in the region Iran still had some reasons to stabilize Iraq to legitimize the pro Iranian government. The Iraqi government is relatively stable and a decent partner with the US considering what Bush and Cheney did to the country. Afghanistan was never a unified country. It was and still is comprised of dozens of tribal fiefdoms that go back to ancient times. The Taliban was previously the largest faction that formed coalitions with tribes and terrorist groups like Al Qaeda before we got there after 911. The government is overtly corrupt and has very little legitimacy especially after the past “elections”. The government is simply not trustworthy partner. The quandary is that this factionous society is the worse breeding ground for terrorists. Along with the never ending income from the opium trade the Af-Pak region will be a terrorist threat for years to come. The question is how do you deal with that threat? That is the big decision in front of the president. Generals like McChrystal want more troops and resources to implement a country wide insurgent strategy similar to what was done in Iraq. Vice President Biden and our allies want to employ a more limited approach on the ground, train Afghan forces and focus efforts on containing terr, including containing the Taliban and Al Qaeda with limited use of force. Both strategies are risky and have their faults but the McChrystal strategy has some fatal faults including treating Afghanistan like Iraq and ignoring the fact that the American public would not support that type of commitment. Vice President Biden’s strategy while not perfect in any regard is the only true way to start forming an exit strategy for an eight year old war. I would implore President Obama to take up the major elements of VP Biden’s strategy. We also cannot let the Taliban destabilize the AfPak region. The biggest story the MSM media failed to notice is how Pakistan has been able to make it’s country much more stable than it was last year. Pakistan needs to become more stable especially it’s nuclear weapons arsenal. In some ways the Af-Pak border is like a playground teeter-todder. The more pressure you exert on one side of the border the more the militants flee to the opposite border. This is one of several reason why the Taliban has refocused their attacks in Afghanistan. I always thought that Afghanistan was a conflict that could never be “won” but could and needed to be contained. I reject the idea of a total withdraw, at least for now, because threats cannot be made to foment in that region. There are going to be no hearts and minds won in the Afghan War. If we become indefinite occupiers the insurgency will grow however if we leave without a containment strategy militant groups will not suddenly become our friends either. 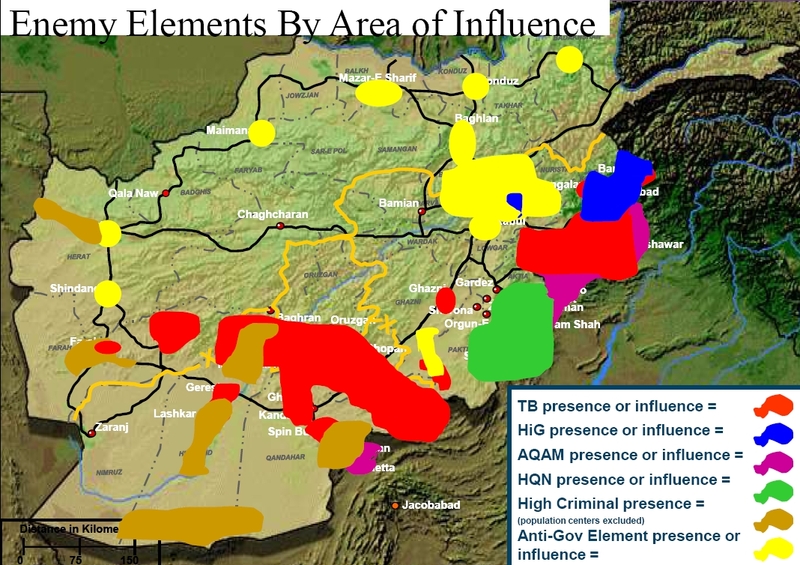 Following are some maps that illustrate the factions in the region. This comparison never fails to annoy me for many reasons but the main reason being that the Bush thugs took their eyes off the ball by starting an illegal and unnecessary war in Iraq. Then they have the gall to criticize your President for their own balls up. What a decrepit assortment of hypocrites. Mess up a war and blame someone else and worse yet, think that you are fooling the rest of America and the world. Some kind of stupid, priceless! You are so right we would be leaving Afghanistan by now instead of Iraq. The bottom line domestic political problem is that Republicans do not support a Democratic president even with wars they previously supported. And a large portion of the Democratic base does not support any conflicts. One valid parallel between Afghanistan and Vietnam is that both governments are/were totally corrupt and worthless as a partner. A distinction between Ho Chi Min and the tali is that Ho did not detest the West and modernity. He admired the US. We could have saved ourselves a lot of trouble if we had not feared the Communist North. Ho was a Nationalist first, and if we had wanted to, we could just as easily have backed him, and much pain would have been avoided. None of that applies to the Taliban. The Taliban are a clear and present danger to the West. Nice insight there are going to be similarities to all wars and that is probably the most poignant similarity in this case. To build on what you said leaving the Afghanstan tot he Taliban will make the country more corrupt and less stable. So summarily withdrawing troops would leave a much different results than leaving Vietnam which stabilized the country. I love maps. You always post great maps, KQ. The power of influence always trumps the power of control. Being able to influence and train Afghan people is the only way no one could ever confuse Afghanistan and Viet Nam. Thanks I’m a visual person and love maps particularly old maps and globes. I have one of those big old fashion stand alone library type globe a real cool leather globe. Afghanistan is not going to end up like as stable or as modern as we the west would like but it can be contained. The honest truth is NATO will have an indefinite presence in Afghanistan unlike Iraq.